It is with great sorrow that we announce the unexpected accidental death of Kris Altomonte in Cochrane Alberta at the age of 31. 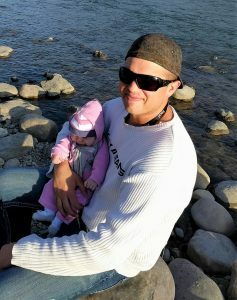 He is survived by his infant daughter, Sammilyn, mother Dana Johnsen, sister Samantha Altomonte, stepfather Mark Makwich, brother Eric Altomonte, girlfriend Sara Brown, grandparents and other extended family, and many, many close friends. Kris was born in Grande Cache, Alberta, and grew up in the south Okanagan. He had worked in the oil business in northern Alberta as a pipe insulator and rope access professional. Kris had recently made Cochrane his family home. Kris was a lively, free spirit with a great sense of humor and an unforgettable smile. He was primary caregiver and very proud of his baby daughter and loved his role as a new father. Kris was taken from us far too soon and far too young. A Celebration of Kris’ Life will be held in Penticton area, details to be posted on Facebook.